1. Build it and they will probably not come. One of the greatest mistakes advisors make when organizing events is thinking that because they have something you believe is exciting and valuable to share or sell that everyone will care and respond accordingly. The way you launch or promote your event needs to be compelling – from your client or prospects perspective. ‘What you build’ also needs to be consistent with ‘who you are’. It needs to convey your uniqueness and your brand. There are some great tips in attracting an audience in truism #4 on Results. Setting a goal for number of attendees makes perfect sense. That said, it’s more important to get the right people attending than it is to fill seats with just anyone. Defining ‘who’ you want to attend before you start creating the event is critical. It’s easy enough to create an event if you don’t care who shows up. 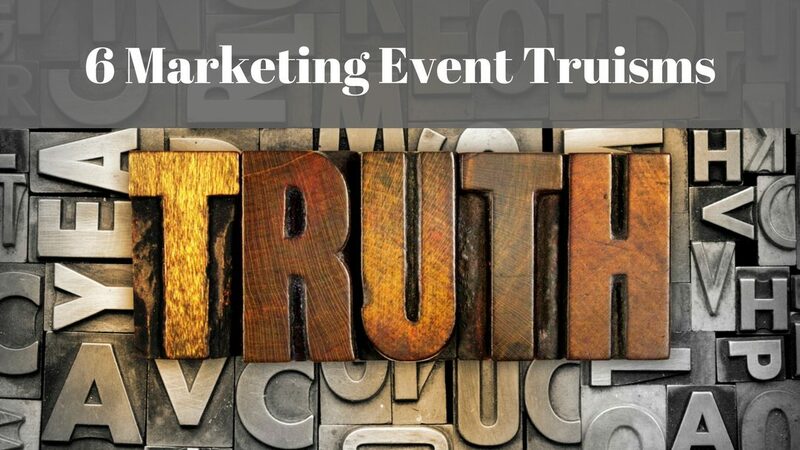 Your event marketing should clearly state who the event is targeted to and what they will get out of it.. Their “value” should include compelling benefits in a short bulleted list. How you present the benefits is often more important than the actual topic and it should be the focus on your marketing. When it comes to running your advisor marketing event — assuming you built it and they came –long introductions and closings (your ‘pitch’) can have a more harmful than beneficial effect. What really matters to people is the content of your presentation or your get-together. If it’s an informational event you’ll need to present expertise and credibility of concept. Facts, story-telling, and quotes will go a long way to engaging your audience. And please never ever create slides you just read. There are lots of “rules” about PowerPoint and one of my favorite is the 6 & 6 rule. No more than 6 bullets per page and no more than 6 words per bullet. Talk – don’t read. Be interesting. Even If it’s just a networking event you’ll also need a focus. This could be supporting a local cause or bringing in an interesting speaker. Make it about the ‘content’ and not the ‘sale’. Sales come from credibility, perceived value and trust. Start there. 4. Give and Ye Shall Receive. Think of ways you can give that will enrich your clients’ lives. As an example, if your event’s focus is estate planning, why not offer to give your time to help your audiences’ adult children with cash-flow budgeting. Perhaps you could set up a free education savings account and deposit their first $100 in it. Papers, checklists and book are nice giveaways but they aren’t quite as thoughtful or endearing. Your time and personal effort will typically be the things that bring the most appreciation. 5. Results are in the Details. Is the value of the event clear to your ideal prospective attendee? Are the logistics of the event clear in your invitation? Have you allowed for enough time for people to plan ahead? Does your invitation make it easy to say ‘yes’? Is your registration process simple? Is your venue appropriate and worthwhile attending? Do you have a call-to-action that resonates? Or is it pure sales? Is your staff ready to fulfill your brand? Does your event topic and style reflect your brand? Have you set goals, objectives and success metrics? Have you collaborated with other professionals to expand your potential audience? Have you properly and widely marketed your event? Is your event repeatable? Can you package it and market it more easily next time? Does registration include a giveaway such as a free paper, book or checklist? Is it clear to your audience what outcome they can expect? Is it clear to your audience what you expect from the event? Do you have a follow up campaign in place? Are your attendees expecting call from you after the event? Have you created a simple survey post-event to determine other topics of interest and feedback? Does your event set you apart? Is your event easy for competitors to duplicate? Have you integrated or promoted your event across your social media networks? You might want to start planning your event by using the above list as a starting point for your event management checklist. Create an event that is true to your brand and your clients’ expectations. Your event should “shout from the rooftops” who you are. If you’re a personable advisor, make sure your event is personable. If you like to tell stories in your meetings, tell stories at your events. Your event needs to be true to your personality and who you are and want to be for your clients.